I woke up and got right to work with some cleaning and house chores. Then it was off to the gym for a brutal (but much appreciated) pre-vacation workout. I went straight from there to Whole Foods for a few vacation snacks. Then to the bike shop to finally pick up my bike. I can’t wait to take it out for a ride SOON! Just sad that I’m traveling the next few weekends so it might not be that soon. I had a few more errands to run, including the grocery store before coming home to clean (some more). I fueled with a PB Chocolate Banana Shake. Yum! When I got home, I put dinner in the crockpot. I feel like I’ve made this recipe before, but couldn’t find it on the blog so decided to share it with you (again?). It’s an easy and tasty curry recipe that you can make in your crockpot. I used some of my favorite spices! My next task was to load up our new dishes (that we just got at our shower) to wash and move into the cabinet. We’ve had so many amazing meals and memories with our old hand me down dishes, and I am excited to pass them along to someone new. I was even more ecstatic to enjoy my first meal on our gorgeous new dishes! And my first ever non-hand-me-down, I picked them myself (with the BOY’s approval, of course), fancy new dishes! They are a grey ombre that look even cooler in person. You’ll have to come over for dinner and check them out. I ate leftovers for lunch all week and each day my coworkers commented on how good lunch smelled. It looked like a mish mash but tasted delish! The other big agenda item of Monday was packing. The BOY and I are going on a weekend cruise with his family, and I wasn’t sure when I was going to have time to throw everything together, especially since I am carrying on…always so tough for me! Grease your slow cooker with Pam. Place the chicken, red pepper, and carrots on the bottom of slow cooker. Place the rest of the ingredients (except water and corn starch) in a food processor and process together until mixture is mostly smooth. Pour the sauce over the chicken, peppers, and carrots, mix well, then cover and cook on low for about 6 hours. ***My recipe only needed to cook 4 hours! An hour or so before serving, mix cornstarch and water together in a small bowl until cornstarch is dissolved. Pour mixture into the slow cooker, stir to combine, and continue cooking for another hour. **This will thicken up the sauce. When the sauce is to your desired thickness, turn slow cooker to warm setting until ready to serve. Serve over rice, with Naan, and garnish with cilantro. It was another crazy busy, non stop weekend! I barely had a minute to sit down and breath. On the plus side, we did get TONS of wedding stuff done! Wedding bands…check! Suits and ties…check! Décor…check! Gifts…check! Invitations…check! 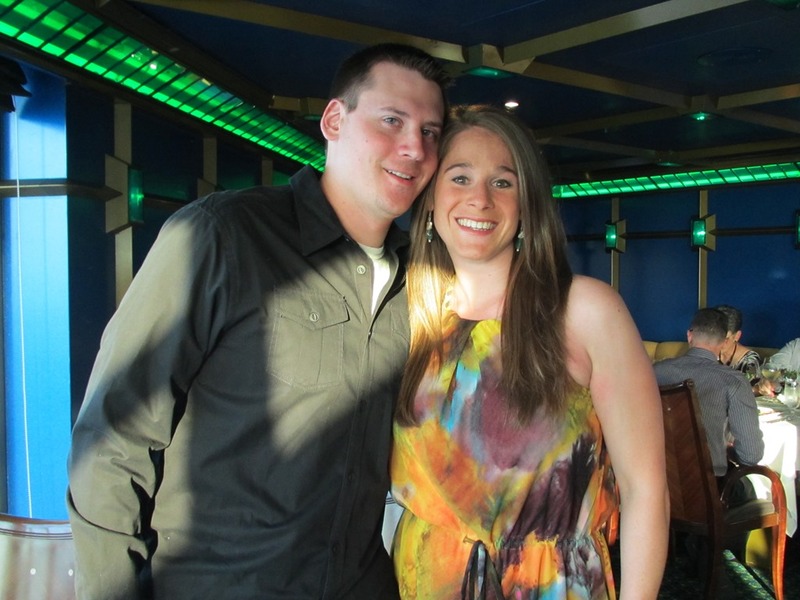 It looks like we are having a wedding…woo hoo! This morning, I went to the gym and my trainer stood me up. This has never happens, but we had some confusion about rescheduling days since I am working next Monday before heading out of town for my bachelorette party. Instead of calling it, I warmed up on the jump rope and hit the weights REAL hard! I started tonight’s dinner before I left. It was supposed to take about 6 hours, but cooked quicker. This always happens in my crockpot! I asked the BOY to add the peppers and pineapple (from memory), and I totally forgot about the OJ. Even without the starch to thicken it up, dinner turned out ABSOLUTELY amazing! Both the BOY and I devoured our dinners and raved about the recipe. This will definitely get added into our rotation. It was nice to have such a tasty and easy dinner after a chaotic weekend to enjoy while we binged on Orange is the New Black tonight. The BOY would tell you that he was happy that the tour was on break for the day…ha ha! I’m off to bed as a new week is about to start! In a 5-qt slow cooker, add pork, onion, and garlic. In a large bowl, whisk together broth, soy sauce, vinegar, tomato paste, Sucanat, honey and ginger until well combined. Pour mixture over pork and gently stir. Cover slow cooker and cook on low for 6 hours. In the last 30 minutes of cooking, combine orange juice and potato flour in a small bowl and whisk until no lumps remain. TRUTH: I didn’t do this step : )Add to slow cooker along with peppers and pineapple, stirring gently to evenly distribute. Replace lid, increase heat to high and cook for remaining 30 minutes. This week, I busted out the cookbooks. Not intentionally, but it started with one and then another, and then a third followed. And the next thing you know, I had a pile of cookbooks, dinner in the crockpot, and a smoothie in hand. Success! It helped to have all of our new kitchen gear! For dinner, I went with a new recipe from a tried and true cookbook 150 Healthiest Slow Cooker Recipes on Earth. I used some of my new knife skills to dice the onion. Then topped it with chicken thighs and sauce. I don’t typically cook with thighs but figured I would give it a chance. Costco has some deals on organic chicken, so I picked up the thighs instead of breasts. Once the chicken was ready to go, I was eager for a snack. Enter cookbook number 2! The new Everyday Detox book from Detoxinista. I recently purchased this one in an attempt to aid my digestion and IBS. I find the concept of food combining very interesting and like that the recipes are simple and clean. My first recipe was the Blended Apple Pie a la Mode. I subbed in almond butter for the avocado which kept the filling fat and kind of went against the food combing, but it turned out delicious! Sadly, I lost the picture on my phone along with a few others…total bummer! I did capture dinner, which turned out flavorful and delicious! The last cookbook I used was the BetterHomes Baking book. I’ve had a zucchini bread recipe tagged in there and a few zucchini’s ripe and ready for peeling in the fridge. But you’ll have to wait on that recipe! Do you use cookbooks or the internet for your recipes? In a medium size bowl, whisk together the ketchup, tomato paste, cider vinegar, mustard, Worcestershire sauce, Sucanat, garlic, paprika, salt, pepper, and red pepper flakes. 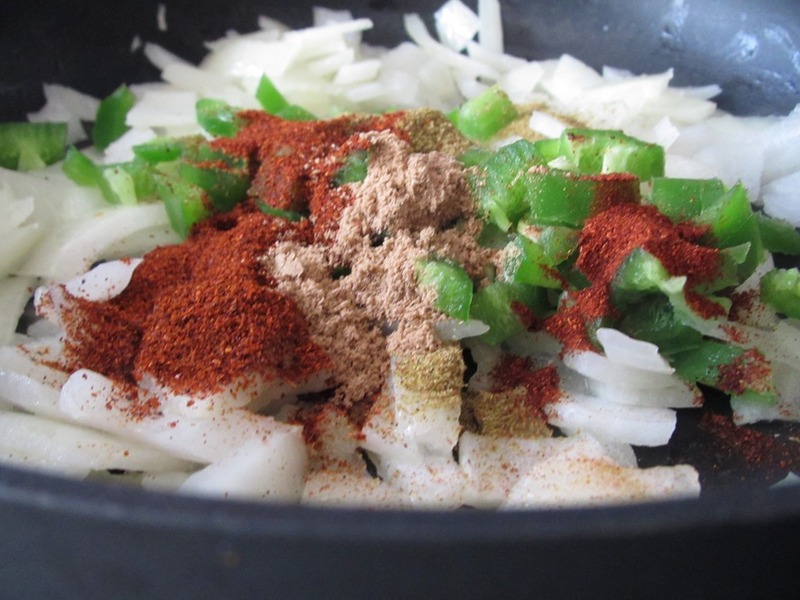 Make a layer of onion on the bottom of the slow cooker, sprayed with cooking spray. Lay chicken thighs over the onion and pour the sauce evenly over everything. Cover and cook on high for 2-3 hours or low for 4-5 hours, until chicken is cooked but juicy. Using two large forks, pull apart the chicken and finely shred the meat and stir well to mix with the sauce. Can serve in taco’s, with a potato, or over slaw. Combine all ingredients and blend until smooth and creamy! Enjoy immediately! I have also neglected to share a fantastic new crockpot recipe with you. Just in time for the weather to cool and me to bust out my fussy socks. What’s super funny is that one of my coworkers (who follows my Pinterest board) also made the same Crockpot Teriyaki Chicken this week. The only bad thing about this recipe is that the BOY devoured a HUGE plate and I don’t have any leftovers for lunch tomorrow! So as you can see below, this wasn’t the most productive month is some ways, but it was definitely a memorable one in others! 1. Go to the farmer’s market and eat more greens-FAILED IT! 2. Throw a fiesta–ROCKED IT! 3. Progress half marathon training-TIED IT! What are your fall goals? Is anyone else a little behind this fall? For lunch this week, I have Curried Red Lentil Soup with Kale. Yum! 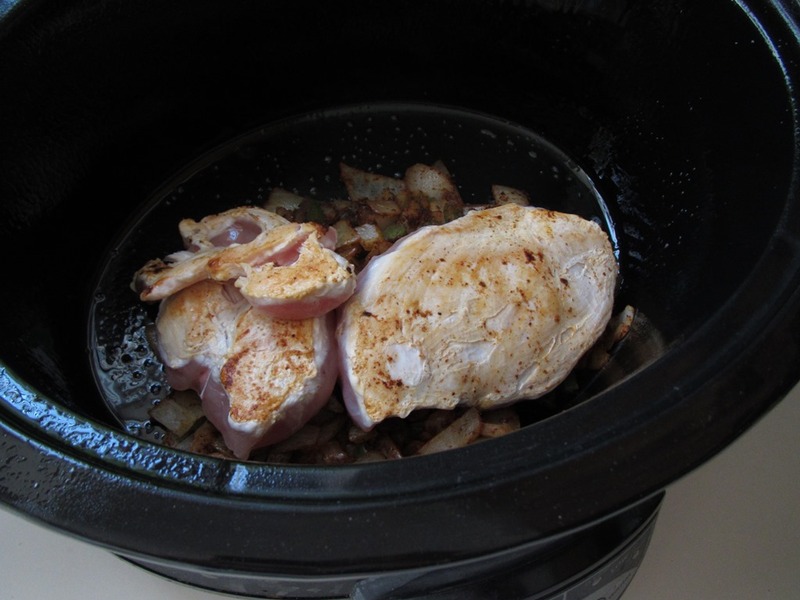 The best and easiest crockpot recipe that I know is this Two Ingredient Crockpot Chicken. I share it with everyone who is looking to use their crockpot more often. When I found this recipe for Shredded Tex Mex Chicken on Fearless Homemaker, it reminded me of a fancier, more complex version of my favorite. This recipe takes just a few minutes longer to prep, but is worth the effort. The addition of the jalapeno and lime are fantastic and give this dish robust flavor. Instead of dicing my chicken, I got lazy and cooked them whole, which is another easy option. When dinner was ready, the BOY made an overflowing Tex Mex sandwich with cheese and sour cream. I opted for lettuce wraps (although I probably should have bought bigger lettuce leaves). We were both big fans of Mexican flavor (in case you couldn’t tell by all the Fiesta posts this summer) and this dinner got thumbs up all around. We also got a good laugh out of my mini lettuce wraps. I ate my lettuce wraps with a side of broccoli, not because it actually goes with the meal, but because we had broccoli that needed to be cooked and topped with avocado. One of my favorite things about this recipe is how versatile it is! I have plenty of leftovers to eat during the week on a salad or wrapped up as a taco. Meal planning this week is weather dependent. We have a big storm blowing in and there is a chance that I will be staying at my parents. Not to worry, I have left the BOY with plenty of healthy options to fend for himself! -Heat the oil in a medium-sized sauté pan. add the onion, sauté for 5 minutes. Add the cumin, chili powder, coriander, paprika, jalapeño, and garlic. Sauté two more minutes. Transfer this mixture to the slow-cooker sprayed with cooking spray. -Sprinkle the chicken pieces with salt + pepper. Add it to the pan where you cooked the onion and spices. Sear chicken on all sides. Then transfer to the slow cooker. Add I lime juice and cilantro and stir. -Cook on low for 3-4 hours or if you have the time cook on high for 6-8 hours until chicken is cooked through. The chicken pieces will be fall-apart tender at this point . You can either leave them as is or shred them with two forks before returning them to the crockpot for another 30-60 minutes. -Serve as tacos, in a sandwich, with lettuce wraps, or with rice. If this blog were a cooking magazine, then this recipe would be listed under the Easy Weeknight Meals section. Love it already? I know…right?! Your sauce mix gets stirred into the crockpot. Then topped with chicken. For hours later, the BOY and I had a tasty and satisfying dinner. The BOY ate his with Tandoori rice and Naan. I mixed mine in with some brown rice and nuked up green beans on the side. The BOY was thrilled with this meal. He couldn’t stop raving about it! I was happy that it turned out so well and as always, happy to have lunch for tomorrow, which I immediately started packing into tupperware. With just a few minutes of prep work, dinner was ready and I had time to catch up on TV, fold laundry, and pack up to stay at my P’s tomorrow night. Easy, healthy, and full of flavor…that’s my kind of dinner! P.S. A few of you noticed that I ‘forgot’ the cream in this recipe : ) I actually didn’t even see it when I went to the grocery store and then reread it as I was placing everything into the crockpot. Typically, I don’t care for cream sauces so my plan was to eat mine without and offer sour cream for the BOY to stir in. He was already half way done with his meal by the time I got the sour cream out of the fridge and said he didn’t want to add it. But, I am sure it is nice and rich with it added, so I kept it in the recipe below. I had full intentions on sharing my thoughts and then got tired and forgot all about the missing cream, so thanks guys! Note: There is more to this recipe (ie cucumber relish) as well as some hints and tips from other cooks on the REAL SIMPLE website. I loved it as is, but I am not an Indian food expert, so feel free to play around. Are you at least ready for some football food??? For some, the superbowl is all about the football. Like my dad who will be watching every play as he cheers on his Giant’s against the Pat’s this afternoon. For others, today is all about watching the commercials waiting for the next hilarious concept in advertising that will be discussed for weeks to come. I’m sure there are a few others who are interested in seeing Madonna perform today. Although if I don’t hear anything old school (ie Material Girls), I will be sorely disappointed. Yet for everyone, the Superbowl involves FOOD! We are hosting a small group today, just the BOY’s sister and her boyfriend, so it is a super simple menu. Focused around my Sunday favorite…chili! With some additional appetizers from our guests, we had a fabulous selection of food to munch on while we watched the game, chatted about life, sipped on beers, and cheered on the Giants! We did leave some room for chili at halftime, but by the end of the game, we were full! Everyone (except me who stuck with veggie chili) agreed that the beef chili was good, but would be better without the carrots. The veggie chili is based on a Whole Foods recipe. It is super simple and tastes delicious. I got up early this morning to chop vegetables and get everything into the crockpot before heading off to yoga with my mom. Add in the broth and give your colorful veggies a stir. Leave yourself enough time for all of the flavors to blend! And so that your hands are free to make the other delicious Sunday Funday foods that are featured above. Enjoy this fresh and hearty chili topped with avocado and your other favorite toppings. Ps This chili freezes well! -Combine all ingredients except broth in a slow cooker, sprayed with cooking spray. -Add broth and stir until well combined. -Cook on low heat (if time permits) until chili is fragrant and veggies are soft and tender.